We needed some table decoration for a birthday. Since the subject to party with is a hobby photographer, we thought of a roll of film with pictures of the person that will lay in the middle of the tables - printed on normal paper of course since negatives are not so easy to look at. There were around 12 meters of table to decorate, and we had A4 paper to print on. Each paper gets 2896 of the 53k pixels; that's 19 pages of landscaped A4 sheets! Still the same problem: How to print? 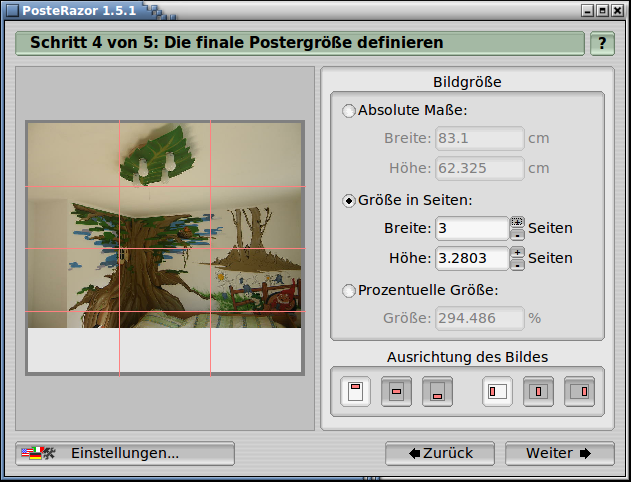 Gimp itself does not have a "print across multiple sheets" functionality. 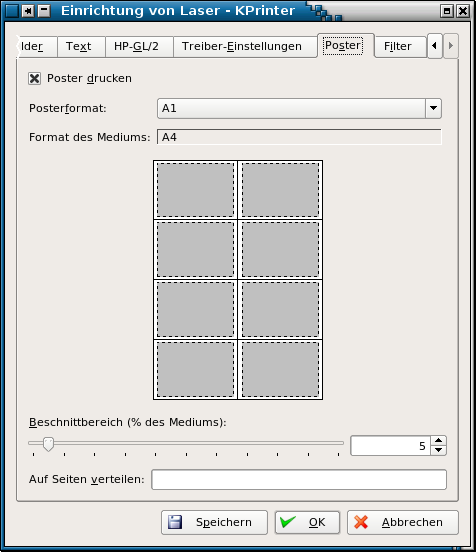 There are several threads on The InternetTM about printing on multiple pages on Linux, but apart from suggesting the poster application for Postscript files, no automated solutions were given. PosteRazor is the tool you want. It takes an image, lets you configure your desired sheet size and creates a PDF file with as many sheets it takes to reach it. Printing that file is easy! It has predefined paper sheet sizes (A4, Letter) and supports custom ones. You may define your printer margins. Setup overlapping. Specify the alignment of the pictures that are not filled. Just everything you need to print that image on a poster. Had I known it a year ago, things would have been easier and this blog entry would not exist. If you want to reset the settings in PosteRazor to their default values, you have to remove the configuration file that is located in ~/.fltk/CasaPortale.de/PosteRazor.prefs. OpenOffice.org Draw also has the ability to print large drawings and images on several pages. Set the sheet size as large as your result shall be, i.e. 5 x A4. Unfortunately it is not really intuitive and you have to try a lot with the PDF printing to get what you want. Currently I cannot recommend it. So kprinter could not be used in my case. 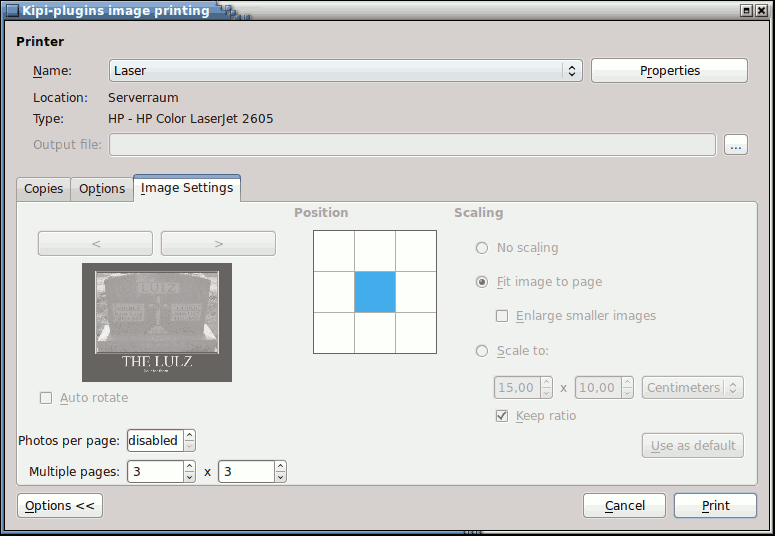 The tip that Scribus would support wallpaper printing cannot be confirmed by me; I did not find such an option there. This two commands crop the first two A4 landscape sized sheets from the large kombi.jpg image file and save them as single-1.jpg resp. single-2.jpg. Our printer has a 0.5cm margin on each side, so there was no need to print an extra glue margin. After cutting the paper a bit and glueing everything, we have a 6m x 0.21m foto strip as table decoration!